The Centers for Disease Control and Prevention (CDC) recently announced that Sanofi Pasteur’s yellow fever vaccine (YF-Vax®) will be unavailable from mid-2017 to mid-2019 (latest estimate as of Oct, 2018) because of delays in the production process. YF-Vax is the only yellow fever vaccine licensed in the U.S.
TravelBug Health is a Yellow Fever certified vaccination center and we have been stocking up our Yellow Fever vaccine inventory as much as we can. We still have some doses available but we expect to run out within the next month or two. Don’t delay in scheduling a pre-travel consultation to determine if you may need a Yellow Fever vaccine to travel. 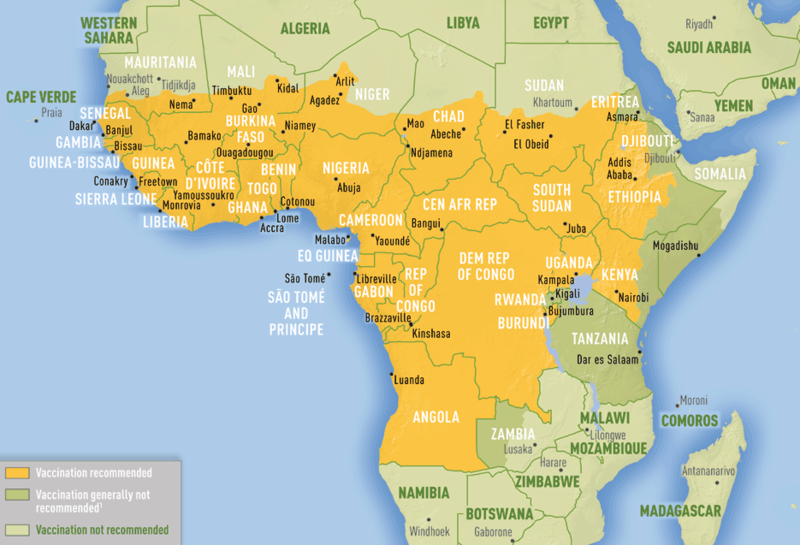 Destinations at risk for Yellow Fever include Sub-Saharan Africa and tropical areas of Central and South America. You can also check out Bug's Blog for more information on Yellow Fever and the YF vaccine. Once current US (YF-Vax) supplies run out, another live-attenuated yellow fever vaccine, which has been used in France, (named Stamaril®) will become available, but only on a limited basis to a few designated clinics in each state. Once more information becomes available from the CDC and/or Sanofi Pasteur, the Arizona Department of Health Services will release a list of centers where a Yellow Fever vaccination will be available. The bad news is that disease outbreaks happen all the time and there is currently an outbreak of Yellow Fever in areas of Brazil that were previously free of the disease (see the CDC travel notice). The good news is that a single Yellow Fever vaccination is now considered to provide immunity for life. Previous guidelines recommended a Yellow Fever booster shot be obtained every 10 years.